I just wanted to pop in here to tell you, that April will be set up a little differently than most months. 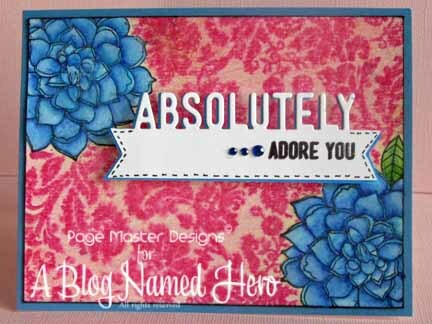 beautifully with the wonderful Hero Arts!!! So Monday to Friday, for the four weeks of April, we’ll be bringing you amazing collaborative projects from our fantastic Design Team, as well as being joined by the DT’s of some of the companies we’re so blessed to be working with. See you back here 5pm EST on Monday April 1st for the start of our month long birthday celebration!!! We do hope you’ll join us!! Hello, crafters! 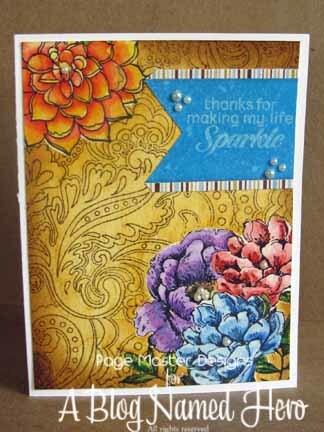 I love to use glitter on my projects and I often use double sided adhesive tape to make glittery stripes. Now I discovered that I can die cut the double sided adhesive tape and get more shapes to apply glitter on! Here is my finished project. I used the double sided adhesive tape like I used to do – to make the glittery stripe and the new way – die cut it to make the scallop. You will need a die, double sided adhesive tape and some baking paper. Baking paper is the only trick here – it prevents the tape to adhere on the die or the cutting mat. 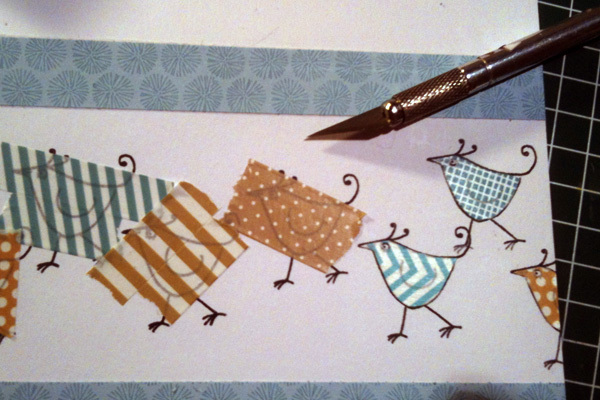 Cut some tape, adhere it to the baking paper and die cut any shape you want. Remove the baking paper and adhere it on your project. Then peel off the non adhesive side of the tape and add glitter. I found some 3˝ double sided tape in my stash and I can`t wait to die cut larger shapes! Thanks for joining me today. Hi, Christine here with some washi tape inspiration. 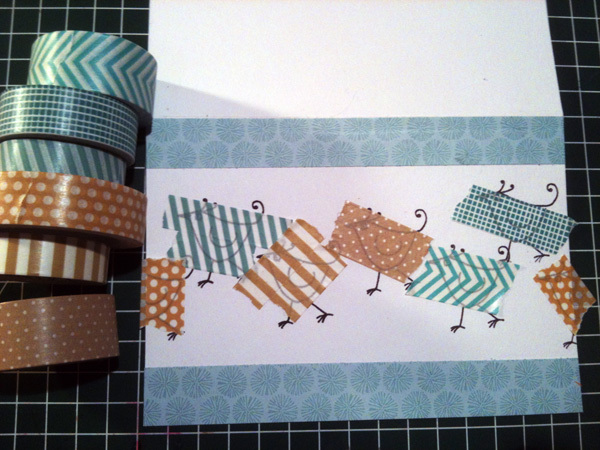 I am a washi tape addict, I can’t stop using it! So I thought it would be good to share some ideas with you. First I got a card that uses tape to color in your stamps. We could call it washi-piecing. 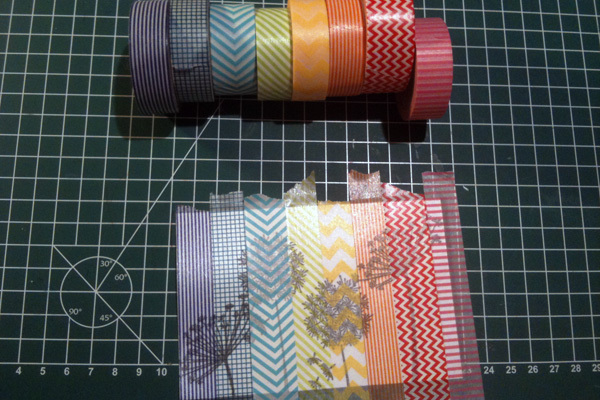 It is so easy because the washi is transparent! 2) Cut around the images with an exacto knife. but be careful! You don’t want to cut the cardstock, otherwise it could peel off when you try do peel off the excess. This was easy, wasn’t it? 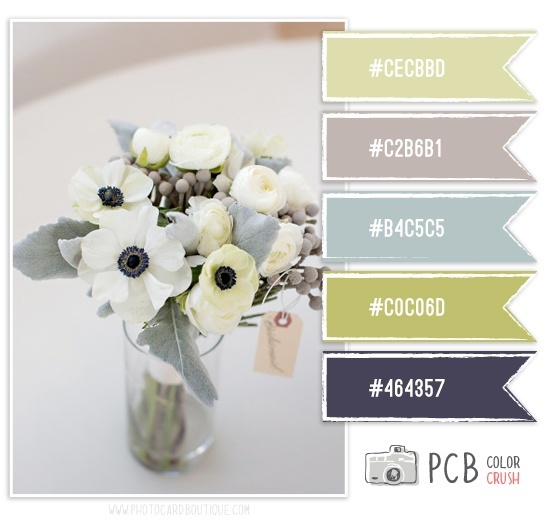 Such an easy way to put beautiful patterns to your images! If we can put the washi tape onto our images we can also put it around the images to create some negative space that adds interest. Have you ever tried this? 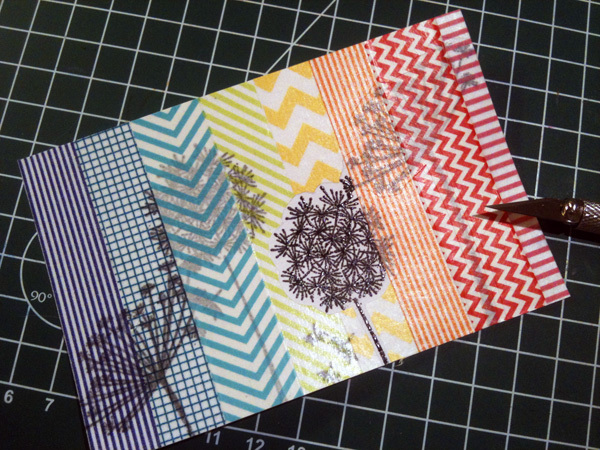 1) Stamp your images and put some washi tape on top – covering your whole piece of cardstock. 2) Cut around the images with an exacto knife. Again: Be very careful not to hurt the cardstock too bad! 3) Finish your card! 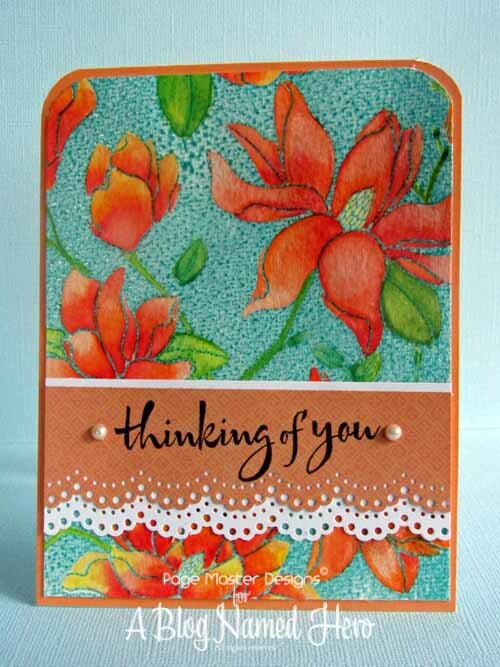 Add your piece of cardstock to your cardbase, add a sentiment, embellishments or whatever you like. I think this is a fun way to use your tapes. Now take out your favorite tapes and try it out yourselves! I love the watercolor look of them. While they are gorgeous I cannot use things like this…they still look like stickers to me when I put them on my cards. It’s personal preference. I really wanted the look…but not in sticker form so I set out to create my own and I am going to share with you how I did it. 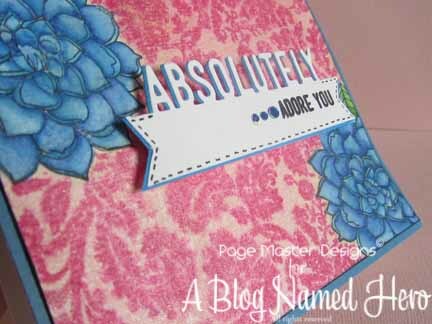 I started by inking my background stamp with Distress ink and then stamped it onto my watercolor paper. Now you can do one of two things. You can add the embossing powder now and heat set and you will have a splotchy but cool effect on the background or you can use your water brush to quickly blend the background and then add embossing powder. Once you have done the background you can start coloring your image. 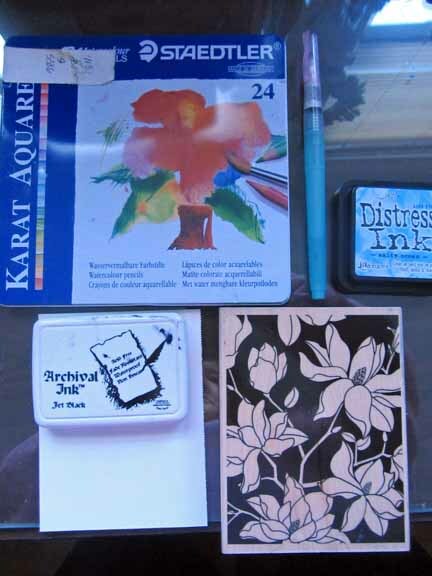 It is important to use embossing powder if you are using Distress Inks. They are meant to work with water and they will bleed if you touch it with the water brush. Here is a small photo tutorial to give you an idea of how I work when doing mine. There are lots of videos out on You Tube you can search for also. It’s pretty simple though. You want to put a high concentration of color in one spot, most likely where you want the darkest color to be and use the water brush to filter in the color along the image. I warn you, this technique is highly addictive. 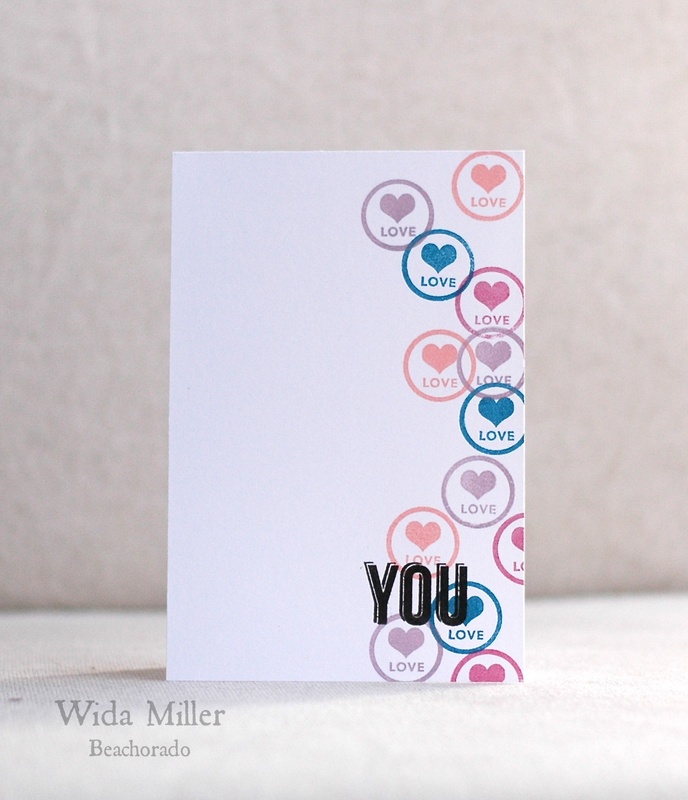 You also don’t need to use the embossing powder for smaller images. Instead use the Archival ink. It won’t bleed. This time I started by stamping the flowers in Archival ink, I masked the ones in the lower right corner, colored them with water color pencils and the water brush, attached the masks back on, I used Distress ink to color in the background then I stamped the Leaf and Dot pattern stamp in Cup O Joe over it. I added a little more ink to the edges for definition. I embellished with a banner and a little bit of patterned paper. I wanted the flowers to speak for themselves. I did the same exact steps. Stamp in archival ink on watercolor paper, color in with watercolor pencils, mask off, cover background with Distress ink, stamp Musical background in Vintage photo and then ink edges. 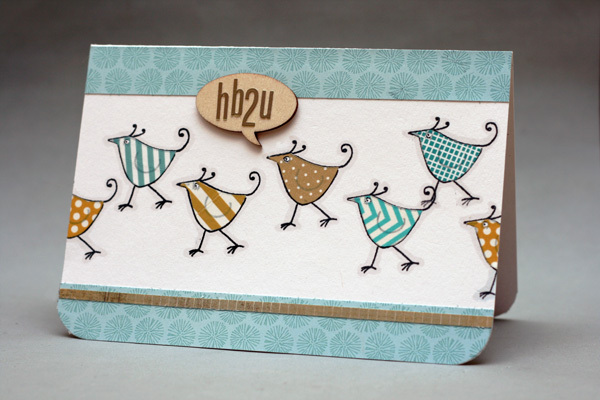 I cut this one into a tag and adhered it using pop dots on the front of my card. I hope I have you some good ideas for using watercolor pencils and water brush with your favorite “to color in” stamps. I hope you try this technique. This months Free Style challenge would be a good time to give it a go. 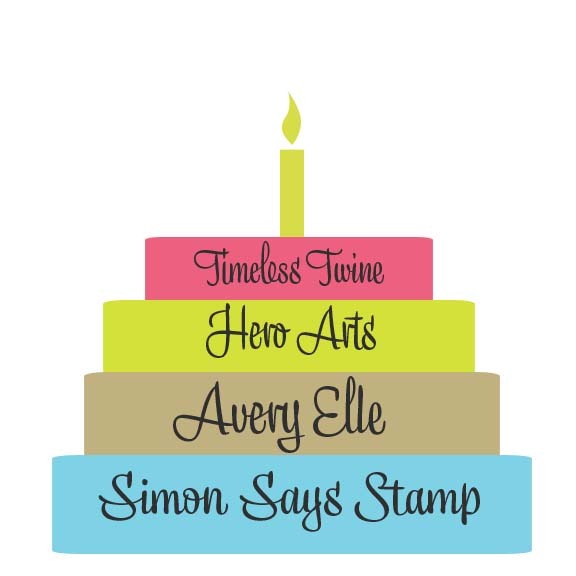 Don’t forget you will be entered to win a Gift Certificate to the most generous SIMON SAYS STAMP. 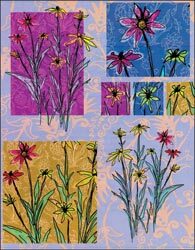 Paper packs–looking though the pages of your favorite paper pack will give you some great color combinations. The experts have already done the hard work, take advantage! Here is an example. Photographs. I will demonstrate that below. Play. 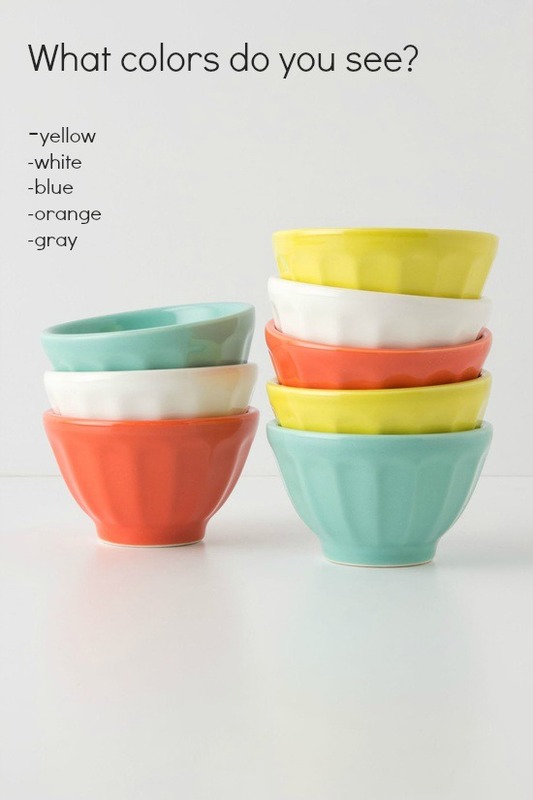 Challenges like Play Date Cafe and Colour Q are great color focused challenges. Runway Inspired Challege and Pinspired challenge use photographs to inspire. First, I had a design in mind. This is the hardest part for me. I have to let it ferment for a while before actually going to a paper and sketching it out or stamping it on scratch paper. This part can take days, no joke. If you don’t have a design that you want to use, random always works too. I found the corresponding inks and went to work. 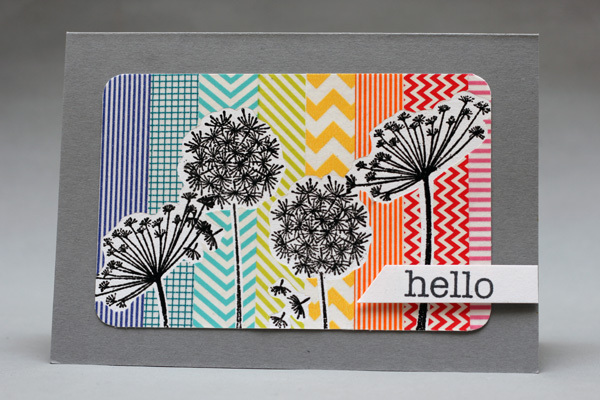 Take the cardstock sized to your needs and draw horizontal lines on it. The width of the horizontal lines is your choice. I chose this width based on my stamp. Using a grid for a guide is essential to keeping it all straight. Stamp the first image in the top corner of the paper. I like to use my fiskers stamp press because it helps keep it all straight. Beginning in this spot (off center) creates interest and will keep your eye from getting too bored by perfectly centered stamping. 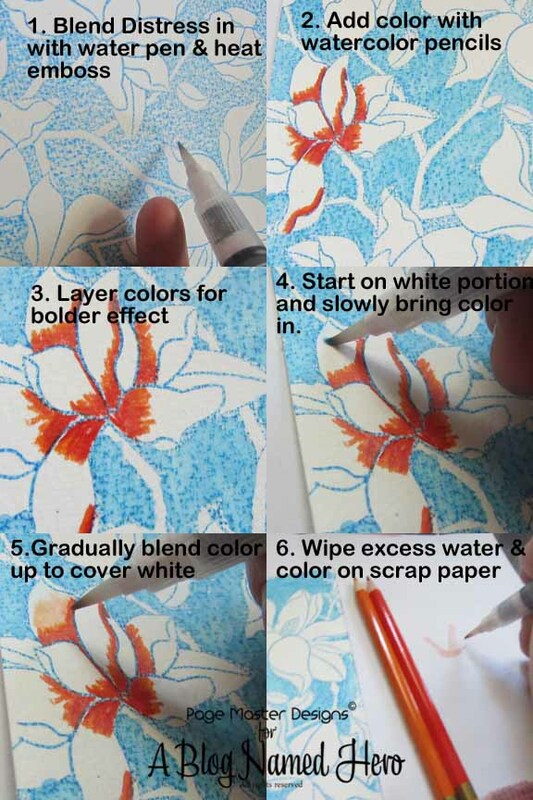 Start adding the other colors by stamping randomly on the page remembering spacing between images and again stamping off the page to keep that visual interest. Erase the pencil lines, embellish and you are done! 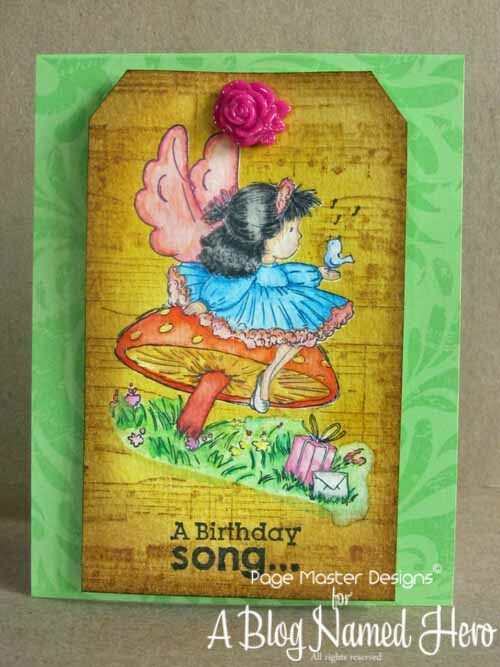 and since I am into working with only a portion of the card space lately, I also came up with this one which shows the random method to background stamping.